Excluding the burnt cheesecake, which was invented at La Viña, San Sebastián, Basque dishes have little presence in our part of town — something that Chef Pedro Samper hopes to upend. An homage to his hometown, the Basque Country menu at The Brasserie is only available once a month, so mark your calendars: the next one falls on Friday, April 26, 2019. Fun Fact: San Sebastian has the highest number of Michelin stars per square metre in Europe and the second highest in the world (coming in behind Kyoto). Ever since he'd begun to make sense of the world around him, Pedro Samper has understood the power of food — how it defines home and how it returns us there, despite the ticking of time, air miles or geographical boundaries. And so a menu is born: a 'touchstone' to home and a 'thank you' to his mentors and colleagues in the UK, Ireland, Japan, and Hong Kong. We begin with the Bacalao "Brandada" & Caviar with Cod Fish on Charcoal Brioche, a 'same same but different' take on the salt cod dip typically eaten with toast points. A hearty dish turned dainty appetiser, it harks back to centuries ago when Basque fisherman had to haul their catch for miles inland, hence the need to preserve their seafood. Similarly, some backstory helps bolster our enjoyment of the Txangurro & Sea Urchin. Traditionally served in a spider crab's shell, the crab stew is now presented in a sea urchin's spiny husk — an idea that doesn't work as well in practice as on paper, as members of our party are visibly put off by the splinters sticking to their fingers. Thankfully, the eggshell in which the Tortilla de Patatas "Udaberri" is served is less of a mess. 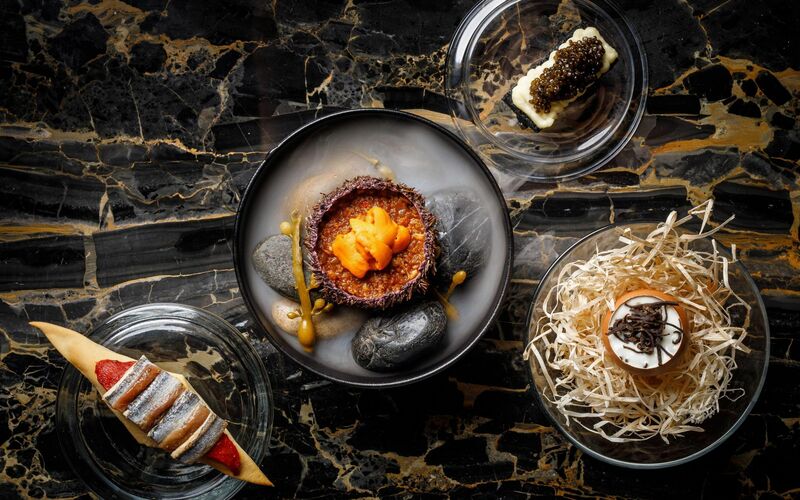 By calling it a 'springtime Spanish omelette,' Samper is alluding to the shavings of black truffle on top; Europe's black diamonds are ripe for picking in January and February, after all. Roasted peppers and anchovies, an evergreen pairing in Spanish cuisine, find new expression in the Antxoa & Boqueron de Getaria. And with this last saline snack, our appetites are full awake and anxious for more. Our favourite fish dish of the year, the Marmitako (meaning 'from the pot') is a Basque-style seafood stew that Samin Nosrat would surely love for its quadfecta of salt, fat, heat and acid. Not unlike a toasted marshmallow, the tender tuna dissolves on our palates within seconds (producing a memory strong enough to make saliva pool in our mouths even today). Samper's second main, the Snapper in "Salsa Verde," Prawns, Green Peas & Clam Juice, toes the line between land and sea with its herbaceous sauce, acting as the perfect interlude before the Carrilleras or Beef Cheeks, Parsnips & Piquillo Peppers. "This is very special to me because my grandma used to make it," says Samper of the full-flavoured bovine dish. Before the swift arrival of Samper's sweet samplings, the chef swings by to notify us: "Our desserts are very lactic." Sure enough, the Caramelised "Torrija" with Lavender Ice Cream & Sesame leaks like a loofah that's been used to sop up spilt milk. Despite its humble origins, the Basque take on French toast, 'pain perdu' or 'forgotten bread' does away with stale loaves, using fluffy brioche instead. Looking very much like an unidentified flying object, the Mamia with Green Apple, Smoked Sheep's Milk & Honey is one of those desserts that demands to be destructed; shards of lime meringue fly left right and centre as diners lay waste to their tarts before demolishing the debris. Mess matters not when eating out, of course — another good reason to explore the Basque Country with executive chef Pedro Samper. Ring 03-2727 6666 or email thebrasserie@stregis.com to reserve your seats for MYR388+ per pax.